Built in 1876, Knockalla Coastguard Cottages is a terrace of cottages set in a spectacular landscape, surrounded by the Knockalla mountains with sweeping views of Lough Swilly and across the bay to the coastline and the mountains of the Inishowen Peninsula. Designed to provide offices and accommodation for the coastguards and their families, the cottages are ideal self catering holiday houses. Knockalla Coastguard Cottages has four bedrooms that sleep six. 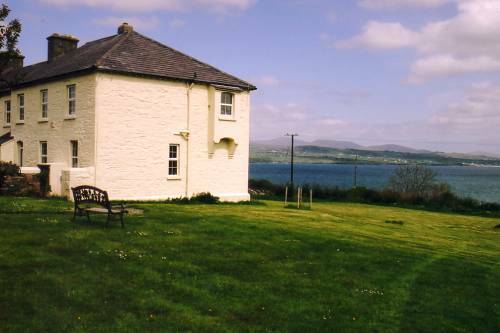 The rooms overlook either Lough Swilly, the Inishowen mountains or Knockalla mountain. There is an open plan living/kitchen area with a fully fitted kitchen and an original open fireplace. The cottage has many original features that are carefully maintained. There is a large shower room and an outside laundry with washing machine. From the large garden you have beautiful sea views. On arrival you will find a welcome pack waiting for you. The cottages are within easy reach of beautiful Donegal beaches, some of which have been awarded the European Blue Flag for water quality. The Fanad Peninsula Coast is a spectacular wildlife area, especially good for watching seabirds and for fishing. Boat trips can be arranged. Visit Ballydaheen Garden & Seven Arches, Ramelton Heritage Town, Flight of the Earls Interpretive Centre, Tir Chonail Horse Riding Centre and Dunfanaghy Workhouse Exhibition Centre. There are good restaurants and pubs in the locality.